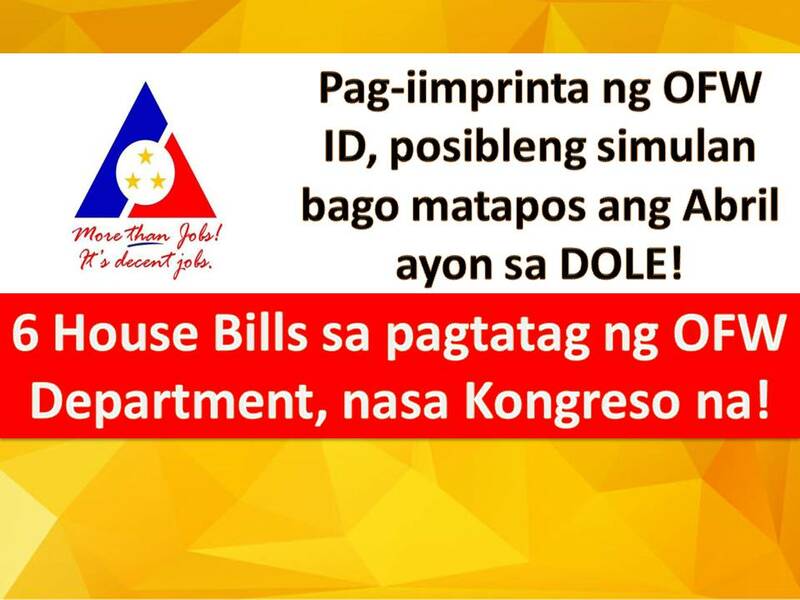 A Philippine Congress should pass a law to create a separate department for Overseas Filipino Workers (OFWs) and for national ID system that would hasten government transactions. The Department for Overseas Filipino Workers (DOFW) if established aims to promote overall welfare, rights and needs of OFWs, which is a fitting recognition to the "modern heroes" of the country due to their significant contribution to the economy. President Rodrigo Duterte received this two main concerns of OFW when he visited the Middle East last Holy Week. As of the moment, there is six proposal in House of Representative to establish an OFW department. 6. House Bill 2334 by Tarlac 1st District Representative Carlos Cojuangco. In National ID system, the President said, there is a bill already filed in Congress. On the other hand, the Department of Labor and Employment (DOLE) has allocated P10 million for the completion of new Filipino workers (OFW) ID this 2017. “This is from DOLE alone. Other agencies have a separate budget (for the OFW ID),” said Labor undersecretary Ciriaco Lagunzad III. The P10 million will be used to create the ID and the mobile application system that will allow OFWs to access the necessary files in government agencies needed for their deployment abroad. “This will become a virtual one-stop shop (for OFWs),” Lagunzad said. Lagunzad added that the new OFW ID will as simple like automated teller machine and the first phase of the six-part project was already completed. “We hope to get this running mid of April…before the end of April we would have already come out with the cards,” Lagunzad said. 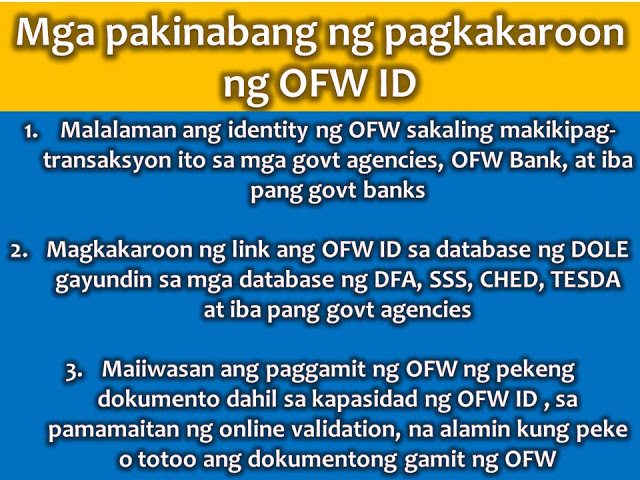 The data and transactions of the OFW ID will be stored in the server managed by DOLE. Lagunzad added that they may also soon start printing the OFW IDs because they are now in the second phase of the project. According to Philippine Statistics Authority, there are about 2.4 Filipinos working abroad last 2016.